Use a new approach to build pecs like the greatest bodybuilder of all time. Bench press, incline press, dip, and dumbbell fly. That's the basic routine Arnold Schwarzenegger used to develop the chest that is considered one of the most perfectly built of all time. Chances are, you already knew this "secret," and you've been following it. So, why isn't your chest more like Arnold's? OK, we'll give you a break. The Oak's pecs were one of a kind, thanks in part to his Herculean genetics, and he had more time to train than you probably do. (We are, however, assuming you have the heart to work as hard as Arnold, whose dedication to the iron was supreme.) But all that aside, using a routine that was popularized a half-century ago while science and experience have revealed far better methods is, as Arnold would say, for "girly men." Set an adjustable bench to a 20- to 25-degree angle and lie back against it with a dumbbell in each hand. Start with the weights at shoulder level and then press them straight over your chest. Note that many benches will not adjust to such a shallow angle. You may need to raise a flat bench on a weight plate or some mats. If he were starting today, Arnold would likely take a much different approach. Since we assume you're a regular guy with a job and only average muscle-building genes, we think you should, too. What follows is a scientific, supereffi cient chest workout akin to what some bodybuilding pros are doing today. It will give you every opportunity to build a set of pecs that emulate the ones that helped carry The Oak to seven Mr. Olympia titles. There is nothing wrong with Arnold's old chest workout per se. It attacks the pecs from all angles and lets you load heavy weights. But most guys have already used it for years and milked it dry. If you're in that boat, it's time for some dramatic changes. Here are some of the new routine's specs. Suspend yourself over the dip bars. Keeping your arms straight, allow your body to sink down until you feel a stretch in your chest. Flex your chest and press back up. Do the bench press last. Benching first thing means you'll always go heavy, and that forces your tendons and ligaments to take on much of the load. To maximize pec growth, you have to make these muscles do most of the work. By placing the bench press last in the workout, you'll be fatigued by the time you get to it. You'll have to use less weight, but the stimulus to your pecs will be greater. It also means you will be fully warmed up, so your training will be safer. machine to a slight decline. outside shoulder width and lower it to your chest. Come up three quarters of the way (before lockout). That's one rep. Perform three sets of eight to 10 reps. On your fourth set, do eight to 10, then have a partner reduce the weight immediately to allow you another eight to 10 reps. Reduce the weight again and repeat. Use different angles. The incline and decline benches you commonly find in gyms are too steep, putting strain on your joints and rotator cuffs when pressing, as well as too much emphasis on your front delts. 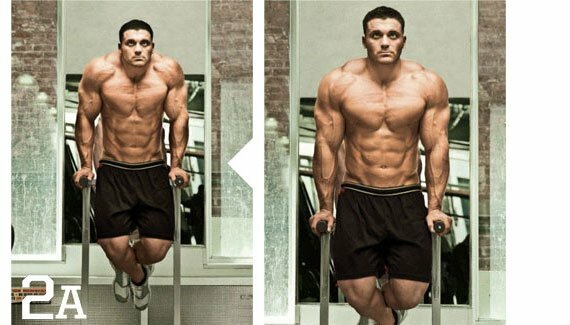 Instead of doing an incline press at a 45-degree angle as you're used to, try working at 20 to 25 degrees. Hold the bar with an overhand, outside-shoulder-width grip. Your shoulder blades should be squeezed together and your entire back arched. Take the bar out of the rack and squeeze it hard. Lower it to your sternum and then pause for a second. Push your feet hard into the floor to help you press the weight up, but stop before lockout. Press it as fast as you can. Do higher reps. Arnold generally kept his reps in the six to 12 range, but reps as high as 25 to 30 can also produce growth. To prevent form from breaking down during such a long set, you'll make use of the Smith machine. Drop sets will also be employed so you feel a searing burn in your chest-a sign that you've worked every muscle fiber to exhaustion. End superset. Resume regular sets.